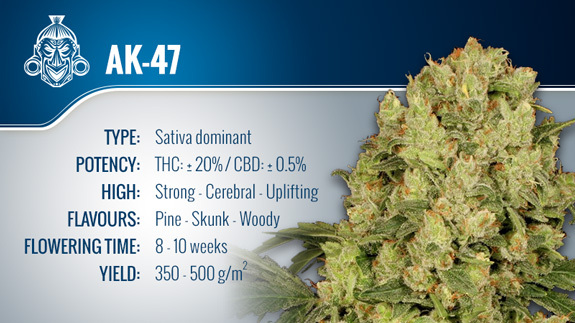 AK-47 is a powerhouse strain that is regarded as one of the best and most potent around for the last decade. It is this his ability to endure the test of time and its superior genetic traits that have garnered it a legendary status. Whilst possessing a violent name, the AK-47 strain does not have a violent intent. Named after the Kalashnikov rifle, one of the most popular and mass produced assault rifles on the planet, the AK-47 strain aims to encapsulate the power and popularity of its namesake. It is for this reason that AK-47 is also referred to as the “one hit wonder” - one toke of this THC laden strain is enough to instil all the goodness you would ever want. Whilst this may all sound like bravado, it is well worth noting that AK-47 is one of the most decorated strains of all time, having won some 16 awards in varying categories over the last decade, including both the sativa and indica High Times Cannabis Cup awards! The original AK-47 was first conceived in 1992 by Simon from Serious Seeds, and was the result of some hard work and dedication. It wasn’t until having tested thousands of potential strains that he finally produced what is now known as AK-47 – a strain that encapsulates high quality characteristics of both sativa and indica strains, as well as a bucket load of charisma. For obvious reason, the exact genetics of AK-47 have remained a company secret; however, Simon has let it be known that it was bred from Columbian, Thai, Afghan and Mexican varieties. Having continued to refine and select the best examples of each crop for breeding, Ak-47 has improved leaps and bounds over the years, turning a great strain into a legendary one. Although there are now many variations on the market, producing both subtle and profound differences as different breeders have experimented with the original, a true AK-47 will produce an aroma and taste that has heavy skunk and pine dominance, with a slightly woody undertone. Lab tests have shown that AK-47 has a THC content in excess of 20%, and it hits with an immediate and long lasting cerebral high. This high is happy, euphoric and motivating all at the same time. Whilst your mind wonders, the indica genetics within AK-47 slide through the body and ease a bit of tension, bringing on a mild body buzz. It‘s a great smoke to sink into music and just lie back and chill out. It also makes for a good sharer, as its one hit wonder qualities mean you don’t need much for yourself. 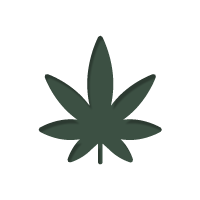 In terms of medical application, AK-47 doesn‘t score very high on the CBD scale. It‘s a THC bomb, which comes with it‘s own range of application, but it‘s main raison d'être is to get you sky high. Anecdotal reports tend to concur that AK-47 is best at relieving stress and pain. In terms of growing traits, AK-47 is a particularly forgiving mistress. She is easy to grow and boasts some relatively fast flowering times (around 60 days), which should make AK-47 attractive to growers of all types - novices, veterans and connoisseurs. AK-47 reaches height of around 1 – 1.5 meters and can produce yields in the region of 500 grams/m2 in an indoor setting under an experience hand. The forgiving and resilient nature of AK-47 mean that it can also be grown outdoors with ease, although the odour it produces is quite pungent, so this needs to be taken into account. On the whole, there is little to complain about here. When you take into account the combined characteristics of AK-47, which are all of a superior nature, it is no wonder this strain has won as many awards as it has, and has retained a legendary status within the cannabis community for so long – it‘s a solid smoke.